Some of the world’s largest and smallest octopuses are found off the coasts of the United States. The second largest is the giant octopus, aka North Pacific octopus, Enteroctopus dofleini (Wülker, 1910), which may grow to over 9 m in length and weigh more than 45 kg. The smallest is the Californian octopus, Enteroctopus micropyrsus, which only reaches 1-2.5 cm in length. 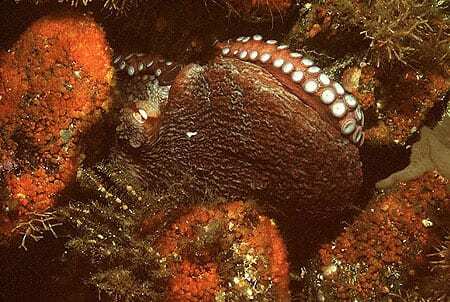 The genus Enteroctopus includes the other giant octopuses of the world (E. megalocyathus off South America and E. magnificus off southern Africa). The giant octopus has a reddish-brown body, called the mantle, plus four pairs of arms, measuring on average about 4.9 m long. The record weight for a giant octopus is 272 kg, but most weigh about 23-41 kg. Newly hatched young are the size of a grain of rice. Octopuses have the most complex brain of the invertebrates (animals without backbones). Like vertebrates, they also have long term and short-term memories. Octopuses learn to solve problems by trial-and-error and experience. Once the problem is solved, octopuses remember and are able to solve it and similar problems repeatedly. The octopus sense of touch is acute in its suckers. The rim of the cups are particularly sensitive. A blindfolded octopus can differentiate between objects of various shapes and sizes as well as a sighted octopus. Octopuses have highly complex eyes which compare to human visual acuity. Focusing is done by moving the lens in and out rather than by changing its shape as the human eye does. When threatened, octopuses will often try to escape by releasing a cloud of purple-black ink to confuse the enemy. Its body will change color, release an ink cloud and jet away to safety. Several blotches of ink can be released before the ink sac is empty. 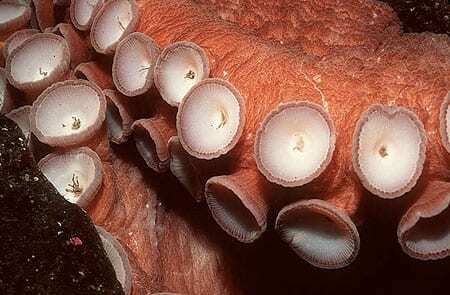 The ink is toxic to an octopus in a confined space such as in a cave with little current flow or in captivity. If the octopus cannot escape the ink (or water is not changed quickly when held in an aquarium), the octopus will become ill or perhaps die. Color change in octopuses is initiated by the eyes. If an octopus is disturbed, special pigment cells (chromatophores) in the skin will be activated in an attempt to blend in with the surroundings. The chromatophores consist of three bags containing different colors which are adjusted individually until the back ground is matched. Coloration reflects mood, white for fear, red for anger, brown is the usual color. Many octopuses produce venomous secretions. This venom is fatal to their favorite prey—crabs and lobsters. The tiny blue-ringed octopus in Australia is one of the very few species in the ocean deadly to humans. Its tiny beak has been known to be able to penetrate a scuba diver’s wetsuit. The giant octopus, Enteroctopus dofleini, lives off the coast of southern California, north along the coastline of the Pacific Northwestern Americas, across the Aleutians and south to Japan. The species occurs at depths from the seashore (intertidal) to at least 750 m.
Octopuses consume mostly crustaceans and mollusks, most often crabs and scallops. Other bivalves, snails, fish, sharks and even other octopuses are also eaten. Octopuses use three different techniques to gain entry to hard-shelled prey: they may pull it apart, bite it open with their beak or ‘drill’ through the shell. Prey that are difficult to pull or bite open are drilled: secretions from the salivary papilla soften the shell of the prey and the softened material is then scraped away with the radula to create a tiny hole in the shell. 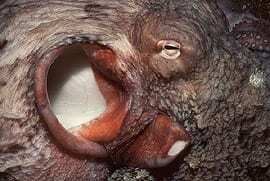 Through this hole, the octopus secretes a toxin that paralyzes the prey and begins to dissolve the connective tissue. The prey is then pulled apart and consumed. The giant octopus lives 3-5 years. When sexually mature, females lay eggs on the inner side of a rocky den and may lay 20,000 to 100,000 eggs over a period of several days. Eggs are tended, cleaned and aerated by females until they hatch. Incubation takes 150 days to 7 or more months, depending on the temperature. Females do not feed while tending eggs and die when the eggs hatch or shortly thereafter. Many of the eggs will die if not tended by the female until hatching. 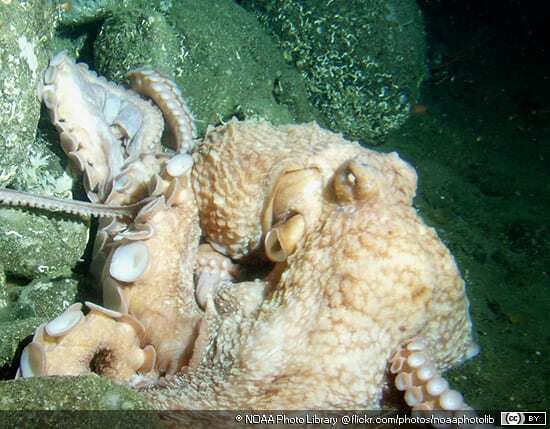 The third right arm of the male octopus is hectocotylized (modified) with a modified tip, called the ligula, that is used during mating, and, in the giant octopus, the arm may be 1/5 the length of the arm. Males may mate with more than one female and females receive fairly large spermatophores (up to 1 m long) during mating. Eggs are laid quite awhile after mating (one report of 42 days in captivity in Hartwick, 1983). 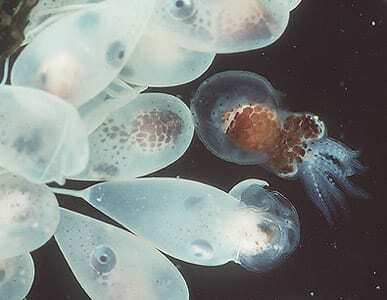 Following hatching the giant octopus young swim toward the surface and spend 4-12 weeks drifting in the plankton until they reach a size of >14 mm mantle length (still under 5 grams). The young then settle to the bottom, although not much is known about this settlement phase. Dens are an important resource to octopuses during all benthic life stages. Dens are used both as brooding chambers and as refuges from predators, including other octopuses, various fishes, and many marine mammals. 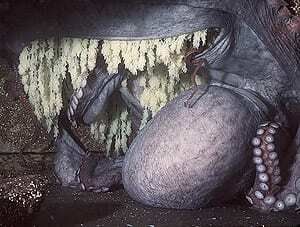 Most dens of juvenile giant octopuses are naturally occurring spaces under rocks or in crevices or are an excavated cavity in sand or gravel under a boulder. Harmless. Encounters by scuba divers report the giant is gentle and curious. It is also commercially fished.